I have always loved a raglan, though in truth, until I started sewing I'm not sure I knew what the actual name was! I've made several for my girls, but only sewn one raglan pattern for myself. While I did really like it, it is also a vneck, so not the fastest sew, and I don't pull it out often to use. 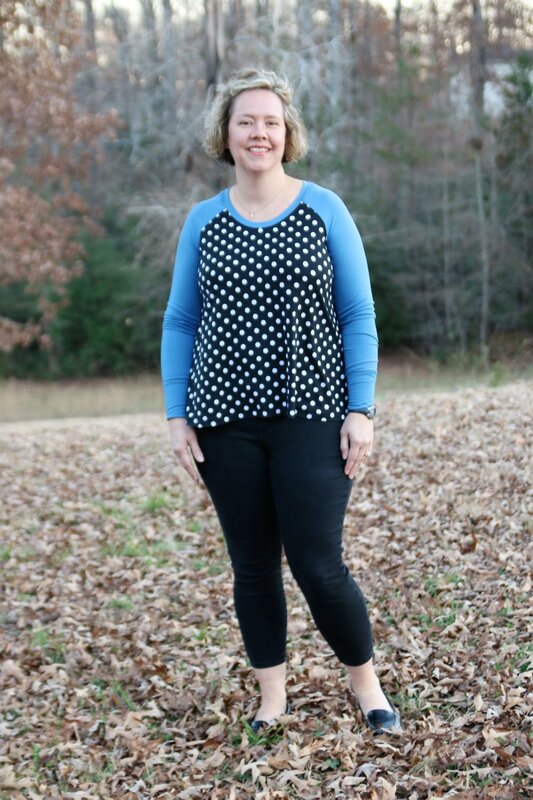 When Tami showed us the line drawings for the new Love Notions Rockford Raglan, I was hooked! 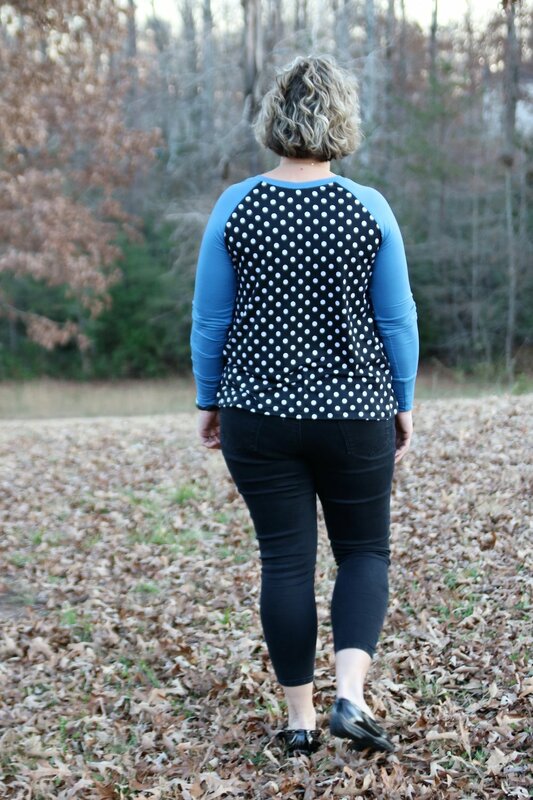 Two of the views have the lovely swing of the LDT (Laundry Day Tee), but raglan sleeves!! Then there's also an asymmetrical hem, and a banded view too...such a versatile pattern! During testing I sewed up View B, the shirt length with swing and I absolutely adore it! I used polka dot dbp that I've had in my stash for awhile (from Mily Mae) and a pretty blue from KnitPop. I kinda wish I'd had enough red lying around for the arms, but the blue will definitely make it a more versatile piece for my wardrobe after the holiday season too! The pattern was thoroughly tested, with several revisions to make sure the angle of the arms and the junction at the neck did just right. *Do keep in mind that depending on your fabric, you may need to adjust the length of the neckband! Once I get my holiday sewing finished, I'm hoping to whip up a few more Rockfords...now to decide between the tunic and the banded! The pattern is on sale for $8 through Tuesday (12/19) - which version will you sew first? This post does contain affiliate links, that if used, at no additional cost to you will provide a small amount to go towards my sewing and fabric love! Thank you!